Congratulations to "Bn100", the winner in Kat's giveaway. Please contact JUST ROMANTIC SUSPENSE to claim your prize. No question, writing dialogue in a novel can be tricky. Each character has a unique voice distinct from the others in the book. Since I’ve never been particularly good at description, letting the characters tell the story is my favorite way to craft a novel. Of course there has to be narration, ways to move the story forward and set the scene, and different writers use different techniques, sometimes a single character’s actions and observations, or just a majority of narrative to tell the tale. But I like dialog. It gives me a chance to get right into the character’s head. I have to think like he or she does, I have to feel as if I am that person. I go out of my way not to bore my readers with stuff like “How are you?” “I am fine.” But once I get my characters talking, I let them talk. I want to hear what they have to say as much as the reader! I’m not really sure how a character’s voice gets into a writer’s head, but they all seem to be distinctly different. Once I sat in front of the post office with the car windows rolled up and tried to hear the voice of every person walking out. It was amazing! No two imaginary voices sounded the same. Strange but true. So I hope when you read my novels you hear the voices of the people loud and clear. 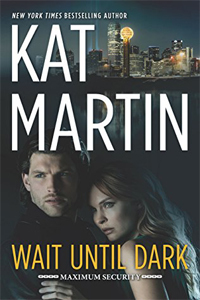 In WAIT UNTIL DARK, my new digital novella, you’ll get to know Jonah Wolfe and April Vale, and meet the detectives, bounty hunters, and bodyguards in my upcoming Maximum Security series, starting with THE CONSPIRACY, out January 22nd. Giveaway ends 11:59pm EST November 27th. Due to GDPR regulations you no longer need to submit your email address in the comments. If you have been selected as a winner your name will be posted at the top of the post. You may then contact maureen@justromanticsuspense.com to claim your prize. Your email address will be shared with the author/publicist providing the giveaway. US residents only for print. I like your title. It's got me guessing.